The purpose of this article is to review human resources development strategies for merchant navy seafarers in two southern hemisphere countries: South Africa and Australia. This is done by assessing the labour market and training contexts for seafarers in both these countries. 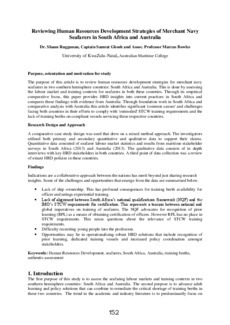 Through its empirical comparative focus, this paper provides HRD insights into current practices in South Africa and compares these findings with evidence from Australia. Through foundation work in South Africa and comparative analysis with Australia this article identifies significant 'common causes' and challenges facing both countries in their efforts to comply with 'outmoded' STCW training requirements and the lack of training berths on compliant vessels servicing these respective countries.